Trev Streat head guide of AGL and President of NZMGA. AGL has been using Yowies for some years now. They are particularly sought after by our guides for early season ascents of Mt Cook and Elie De Beaumont which involve long approaches up glaciers in deep soft snow. We have had no durability problems with these snowshoes despite the regular and heavy use they receive. The simplicity of the binding, the ability to "pigeonhole" up steep slopes in the Yowies and their durability and light weight gives them a distinct advantage over other designs with a hinged footbed. I thoroughly recommend them. Johnathon Morgan New Zealand AGL Head Giude, and BC Canada Heliski Guide. 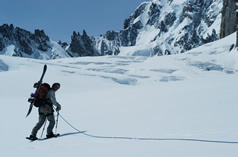 Shown here leading snowboard accent of Mont Blanc. 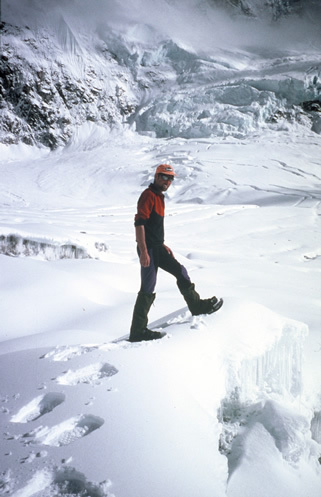 British/New Zealand Kangchenjunga NW Ridge Expedition attempted this rarely climbed route on the world's third highest mountain in the post-monsoon period of 98. Despite the heaviest monsoon for 30 years depositing huge amounts of snow on the mountain, we were able to reach 7500m without supplementary oxygen, before retreating due to appalling weather. We were able to take along 2 sets of Yowie snowshoes to evaluate them in extreme conditions. 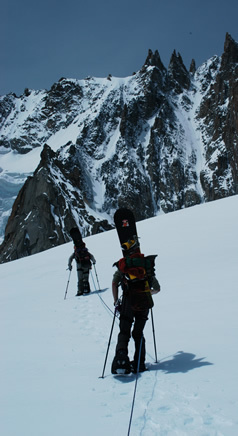 They were used in the upper part of the route between camp 1 and camp 2; and from C2 to the foot of the 1000m NW Face. The route from C1 to C2 followed the lower glacier for an hour at approx 5400m, before heading up dangerous ground below hanging seracs and through a short but nasty icefall. Thereafter we followed a steep snow basin into the enclosed upper glacierbowl, before threading our way through shifting crevasses and seracs, and across ice avalanche and rockfall debris to C2 at about 5900m, a trip which took between 3 and 7 hours camp to camp. This camp, and the surrounding glacier were subject to incredible temperature variations - we measured 50C in our tents during the day, and -30C inside at night. From there, we had a short slog across the head of the basin to reach the NW Face at 6000m. This trip varied from an hour to more than twice that, depending on new snow depth and the amount of fresh avalanche debris around. In a climb that was perpetually threatened by massive avalanches, this part of the route was worse than the rest, which tended to speed everybody up somewhat. Despite the temperature fluctuations, and the extreme conditions under which they were abused, the Yowie Snowshoes performed superbly. They were light and very simple to use - two great assets when oxygen deprivation and general exhaustion make even the simplest tasks hard work. I suppose, a fitting endorsement, they were argued over who got to wear them. We become rather gung-ho about using them, taking them over the terrain normally the preserve of crampons and strong hearts. 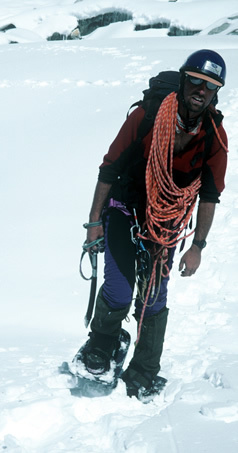 Thus they edged around crevasses and across narrow snowbridges; on too many occasions they were totally abused by wearing them across rockfall debris, where they were subject to huge pressures and stresses of running sideways across these danger zones: and finally they survived five weeks of walking in to Base Camp and back out again, strapped to various porters' and yaks' backs, across swollen rivers and through dense jungle. All in all, a good versatile, light yet strong snowshoe. For carrying loads, or for non-technical ground and even glacier crossings, where snowshoe conditions are less than ideal, these are great tools.